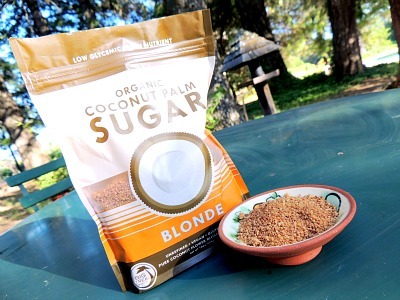 Coconut Palm Sugar - the low glycemic, healthy alternative to sugar. Coconut palm sugar may be the solution to your sugar addiction! I hear from many readers who cannot imagine a life without sweets. It’s true that we are drawn to the sweet taste but how sweet does it need to be? How would you like to have a natural sweetener that doesn't make your blood sugar skyrocket (which triggers fat storage) that is more mild but also more flavorful? You will find after you have started eating low glycemic foods that you will lose your taste for super sweet foods. In fact, they will taste much too sweet! And this is a good thing because the truth about white sugar is it makes you fat and then it makes you sick. Millions of people are suffering from high blood sugar from eating too many high glycemic foods. White sugar in all of it’s forms, sucrose, fructose, glucose, high fructose corn syrup and even the milk sugars, lactose and maltose are added to all sorts of processed foods. No wonder it’s difficult for people to overcome their addiction to all things sweet. Coconut palm sugar on the other hand tastes very similar to brown sugar with a slight caramel flavor but it's so much better for you because it will not raise havoc with your blood sugar! It is made from the nectar of the coconut tree flower blossoms and it is very low glycemic. In fact, it has a glycemic index of 35 and was tested by the Phillipine Food and Nutrition Research Institute. As sweeteners go this may be the lowest of them all. What about nutritional content? It is especially high in potassium, magnesium, zinc and iron and is a natural source of the vitamins B1, B2, B3 B6 and C. It’s because of it’s rich nutrient content of minerals and enzymes that it is absorbed slowly into the bloodstream. Coconut palm sugar comes from the coconut palm which has been called the “tree of life” because it has so much nutritional value in it’s meat, the juice, coconut milk and coconut oil. It is actually made from Coco Nucifera, the green coconut tree which is a different palm species than the one that produces oil. The harvesters climb to the top of the tree to cut off the tips of the flowers and then extract the nectar into bamboo tubes. The nectar is later boiled and then crystalized in brown sugar molds. Palm sugar can be used as a 1:1 replacement for granular cane sugar. This is remarkable. It is the only replacement for cane sugar that I’ve come across yet that is like it in all the important ways but without the toxic affects. Unlike other low glycemic sweeteners palm sugar is crystalized into a granule like cane sugar. It’s the texture of brown sugar and actually more flavorful than white sugar since it’s not so refined. It’s the ideal low glycemic sweetener to use in baking because it is so like brown sugar in texture and flavor. You do not have to give up eating baked goods. Palm sugar has long been used in southeast Asia and in herbal medicine. With a few adjustments we can continue eating desserts. We just need to be smarter about the ingredients and use whole wheat flour, quinoa flour, barley flour and palm sugar as a brown sugar substitute. So how does this taste? Find out when you try this dessert. Be sure that the palm sugar you buy is pure coconut palm sugar. There are apparently some on the market that are mixed with cane sugar and other high glycemic ingredients. My favorite brand is made by Big Tree Farms because they work directly with the coconut palm farmers on the island of Java and have created farmer cooperatives and a processing facility to ensure a quality product with no additives. If you cannot find it in a store near you check out their website at www.bigtreefarms.com and order it online. This list of raw foods is a powerhouse of nutrients and will accelerate your fat loss. Calcium rich foods are low glycemic foods unless they are full of additives. These are the plant fats primarily although fish contains the essential fatty acids. High fiber foods are key to permanent fat loss. All pastas are low glycemic but some are better than others. Find out which grains are the low glycemic ones. Breakfast is still the most important meal of the day for you to get right and sustain low blood sugar all day. Here are some great ideas for your low glycemic eating plan. These foods make a salad into a complete meal that is rich and filling. You don't have to give up sweets, just it the right ones. It's easier than you think. You get over your food and sugar cravings when you eat the low glycemic way. These foods are a treasure trove of good fats and protein. Make this a meal replacement as a permanent fat loss strategy. Return from Coconut Palm Sugar to Foods That Lower Blood Sugar. Return from Coconut Palm Sugar to Lifetime Fat Loss home page.